To help you visualize how far your 5B is from a 60° reading angle, I have superimposed the picture you provided with a sketch of a 60° angle. I have also superimposed the images of the 5B and the 4 soundboxes; the image speaks pretty much for itself and clearly shows, by looking at the needlebars, that the two soundboxes approach the grooves at a significantly different angle. Marco, I see what you're saying, but also these are casual snaps from a handheld phone. 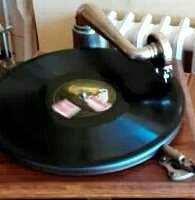 The image isn't level, as can be seen in both of these images by the fact that the side of the gramophone slopes slightly upward from left to right. I can't do it right now because I'm at work, but in a few hours I'll take a new photo of the 5b at least, with my phone resting on a level surface. Okay, I took new pictures, both of them from as straight on as I could, lined up as similarly as I could. Then I overlaid a 60 degree angle eps that I downloaded, changing the white background to transparent and changing the black angle line to red for easier visibility. It would seem that neither soundbox sits with the needle at 60 degrees. I blame myself for the 4; I inserted the American ring and isolator, which has the bayonet pin integral to it, by eye. It's also in there too tightly to move. But the 5b was not only factory set, HMV isolator/ring assemblies do not have an integral bayonet pin. The upper set screw is actually the bayonet pin, going through the rubber and brass which are pre-drilled to pass it through. It is then confirmed that the two soundboxes approach the record at different angles, and in particular that the 5B approaches it at an angle that is not gentle with records. I believe that 60 degrees has to be considered a sort of upper limit still quite OK but not to be exceeded, rather than the ideal one. I remember reading recently in the "Gramophone Tips 1927" that Capt. H.T. Barnett considered this angle harmful to the record, and suggested it to be reduced to 50°. Hello, hobby colleagues! Nice to be in this forum so interesting! In my opinion (and measurements) the HMV 102 has noticeable tracking error, especially in the outer grooves of a record. Careful observations lead me to think that the HMV 101 has a much better tracking. The problem with HMV 102 is the short tonearm... I've been lately noticing that 101 is match gentle with records that 102, especially when using soft steel needles or bamboo, with a properly cared for sound box. Maybe it is because of the slightly longer tone arm in the 101. For the 102 benefit, I will add that the tracking error is minimum at the inner grooves where the damage is likely to be worst. I must rectify my former declarations... Yesterday I took out my two HMV 101 and the 127 and did some careful examination of the three machines. They have the same size of tonearm. Them free have the same tracking error, which is great at the outer rim of a12* record, and almost good at the inner grooves, similar to the 102. So 101s don't have better tracking than 102s. The only one in my collection with good tracking is the 194, with the longer tonearm, but to use the best tracking, you have to remove the bayonet screw, to be able to twist the soundbox to the best angle each time you change the needle length. Thus, it is always possible to get the best tracking. I measured the best overlap and marked it on my paper protractor, so I always have that reference for adjusting the overlap to the best one, by twisting slightly the soundbox. Nevertheless, the 102 is much shorter than the 101. It is a Pity that the 101 having a longer tonearm, could have been designed with much better tracking. I've noticed that if the gooseneck part of the tonearm had been formed at a more opened angle giving it a larger offset, the alignment would have been much better... Still I'm tempted to modify it so to obtain a best tracking! Last edited by Inigo on Sat Apr 07, 2018 2:56 pm, edited 6 times in total. There is an easy trick for right alignment, once you've adjusted all parameters for the best tracking on your machine. Using a standard protractor, once the adjustment has been done, you move the needle to the spindle, and align the needle-tonearm bearing axis with the spindle-tonearm bearing axis. In this position you can see the true overlap. Then you turn the paper protractor around the spindle so to align the main axis with the position of the needle, and you mark with a pencil the point where the needle rests on the protractor axis. Thus you register graphically the best overlap on the main protractor axis. Each time you repoint and readjust the needle on the socket, you align both the tonearm and the protractor to the spindle-tonearm bearing axis, and make the tiny adjustment of the needle projection and the soundbox tilt so the needle falls on the perfect overlap mark, and voilá... you have the best alignment very fast!